Data science is one of the hottest, most lucrative careers in information technology. It’s no wonder that it landed the No. 1 spot on Glassdoor’s list¹ of 50 Best Jobs in America – IT jobs have high overall job satisfaction, stellar annual salaries, and a vast number of available jobs. If you’re looking for a career that’s diverse, challenging, and exciting, information technology is the answer. And one of the fast-growing areas of IT is data science. As a data scientist, you could work as a business analyst, statistician, or spatial engineer; you could specialize in cybersecurity or fraud detection. The first step to becoming a data scientist is getting an online degree. Here’s why earning a data science degree is a smart idea. Data scientists get to enjoy great salaries no matter where they work. Indeed² lists the average salary of a data science professional at around $132,000. Forbes³ reports that entry-level jobs in this field could pay up to $95,000. And salaries quickly jump into six figures with specialization, experience and continued education. If you’re interested in data science, you don’t even have to go into management to earn a high salary. Being an expert on certain subject matter or particular areas of data science are both very lucrative. 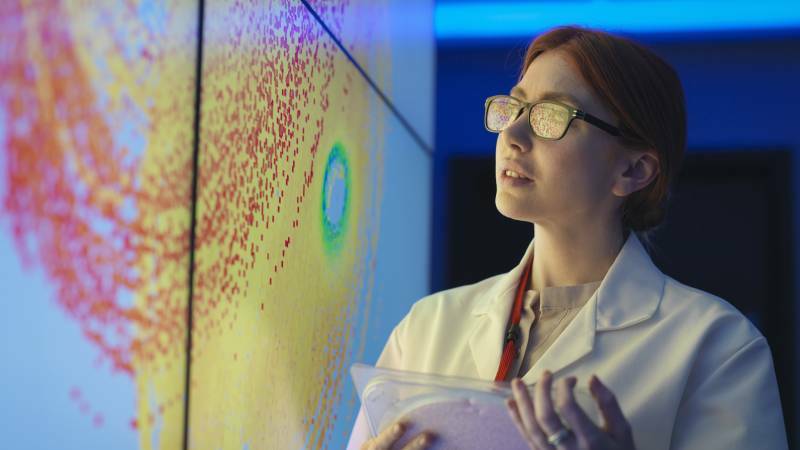 There are even more reasons to make data science your degree choice. Keep reading to find out why these professionals are in such high demand. Data scientists have become ubiquitous across all industries. While the tech industry is where most data science professionals end up, there are positions in all kinds of companies and fields, from government to sports to creative endeavors. No matter what kind of data science job you’re interested in, the field and its opportunities are growing fast. According to the U.S. Bureau of Labor Statistics⁵, job opportunities are expected to grow 19 percent by 2024. By some estimates, the IT sector will have to fill millions of jobs over the next few years. Data science is one of the strongest prospects. There are more opportunities than ever to dive into a data science education. Online courses are rolling out now for Associate in Arts or Associate in Science degrees – and these degrees take just two years to complete. Now more than ever before, online degrees programs are widely available and reputable. You can find data science degree programs offered by plenty of colleges and universities. Online programs are convenient and affordable, and most courses track closely with the curriculum you would expect if you were attending classes on campus. And you can work at your own pace, fitting classes into your schedule. You could complete an AA or AS degree as quickly as you need. If you’re making a career change, data science is a smart investment in your future. Almost any background is compatible with data science. Knowledge of business, economics, biology, history, and other subjects will only broaden your talent and effectiveness as a data science professional. To begin you new career, all you need is a background in data science – and you can develop this background by earning a data science degree. With flexible online program options, anyone can begin working towards their degree. If you think you have what it takes, there’s no reason you can’t start researching online colleges today. As demand for data scientists increases, schools are making it easier than ever to get your education. Interested in earning a data science degree? Start a search today.